A city guy should cycle often. Depending on where you live, that might be year-round or a few short months. But even the casual rider knows that some pants can’t stand the friction. Over time your movement whittles away the material until all that’s left are a few strands between liberty and your crotch. You can patch the hole or purchase new pants. Or you can buy pants or jeans made to handle the abuse and abrasion when you’re on your bike saddle. Levi’s constructed the Commuter 511 Slim Fit Jeans ($108) for the hip and urban cyclist but they also have an entire Commuter line with different styles. The 511 skews more slim than skinny and the fabric offers some elasticity that makes for a more comfortable ride. These jeans even offer a spot to store your U-lock. Roll your pant leg and reveal that reflective tape on your inner cuff. The crotch is reinforced and the jeans have a button fly. These pants are stylish even when you’re not riding. SWRVE’s focus is apparel for urban cyclists. They’ve got plenty of cycling gear, including knicker, shorts, and jackets. If your commute is cold or it rains often, try the Midweight Regular Fit Trousers (US$125). Made from mid-weight material that dries quick, they’re advertised as formal enough for a casual office environment but sturdy enough to survive your rides. Support Canadian businesses and purchase MPG Broadway Pants ($70) from Mountain Equipment Co-op. They lack the style of pricier options but they do come with reflective details and a little spandex in the fabric. Choose this if your daily commute is to a coffee shop and you have no co-workers lobbing criticism from their cubicles. Performance and denim seem like strange bedfellows to everyone except for Rapha, another purveyor of fine cycling clothes and accessories. Like the Levi’s Commuter Jeans, Rapha jeans ($265) feature elastane for a cozy ride. The fit is a standard straight leg so there’s no need to worry about your pants squashing your private bits. Added bonus: deep pockets to hold your stuff and a reflective brand logo that you can show off when you roll up the jean’s right leg. Land’s End says its hometown, Madison, Wisconsin, is one of the most bike-friendly areas in the United States. Their entry, the Men’s Madison Cycle Chino Pants ($39.99) in Golden Khaki, is affordable but doesn’t skimp on the features you need. It has a loop for bike locks, reflective taping and a cotton-spandex blend. Ordinarily I’d turn my nose up at pants with cargo pockets. These don’t bother me. Besides, a pocket for your cellphone and the price tag mean you can ride to the bar and have more money for drinks. 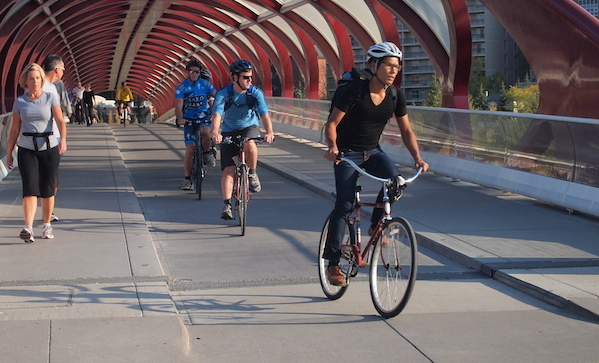 Photo courtesy of Bike Calgary.